The Debenhams Cup was one of several short-lived football competitions introduced in the 1970’s. It lasted for just two seasons 1976-77 and 1977-78 and was competed for between the two sides from outside the top two divisions of the Football League to have progressed furthest in the FA Cup. If teams had made the same stage of the competition, a system was in place beginning with replay eliminations to work out the 2 sides who had gone the furthest. How did the Debenhams Cup come about in the first place and how were the FA persuaded to allow a sponsor to be associated, even indirectly, with the FA Cup when it would not be for another 18 years (until 1994) before they allowed sponsorship of the prized trophy itself and even then it had to be specifically called The FA Cup sponsored by Littlewoods. The story is surprisingly simple, one of Debenhams consultants put the idea to the sales director. Within two weeks it received board approval and from then on it was a tale of three Fridays. On the first Friday, at a meeting at Lancaster Gate, the sales director and the consultant met Ted Croker. He was told of the plan and agreed. Croker appreciated the novelty, the appeal for the lower clubs (the backbone of the competition) and the fact that it added only two games at most to the fixture list. He put the item on the agenda of the FA Council the following Friday. There it was approved pending the agreement of the Football League. This was given and on the third Friday the details and costs were worked out at Lancaster Gate. Just in time for the first round of the FA Cup. Not the sort of speed record one normally associates with governing bodies but evidence, Debenhams believe, of what could be achieved when a good idea is fueled by enthusiasm. Debenhams’ total commitment was a reported £20,000. The prize was a ‘handsome silver trophy’ & £7,000 for the winners and £5,000 for the runners-up. Apart from the prize money £8,000 was being contributed to the FA specifically for youth soccer. The first season saw Football League Division Three sides Port Vale and Chester meet. They had both reached the fifth round before losing to Aston Villa and Wolverhampton Wanderers respectively. The games were played at the end of the campaign; Vale won the first leg 2-0 and saw them as firm favourites to win the trophy. But Chester turned it around with a 4-1 victory on the night and a 4-3 success on aggregate. It was their first national trophy. However it was the following season that we all became aware of the existence of The Debenhams Cup. In the second year of the Debenhams Cup, a new series of awards were announced. They were to be made for each round of the FA Cup in which teams from the third and fourth divisions and non-league dubs were competing. They were to be presented to the team which, in the opinion of a ‘distinguished’ adjudicator nominated by the Football Association, put up the best giant-killing performance of the round, that is to say against a team from a higher division. The first of these awards was made in the Third Round to Hartlepool United for their 2-1 home victory over Second Division Crystal Palace. This was followed by a second award in Round Four, this time to ourselves in recognition of our ‘spIendid’ away win at Stoke. It is believed the team were presented with tracksuit tops with Debenhams on the back as reward for there Result of the Round. The adjudicator in both of these rounds was the celebrated recently retired international referee Mr. Jack Taylor. 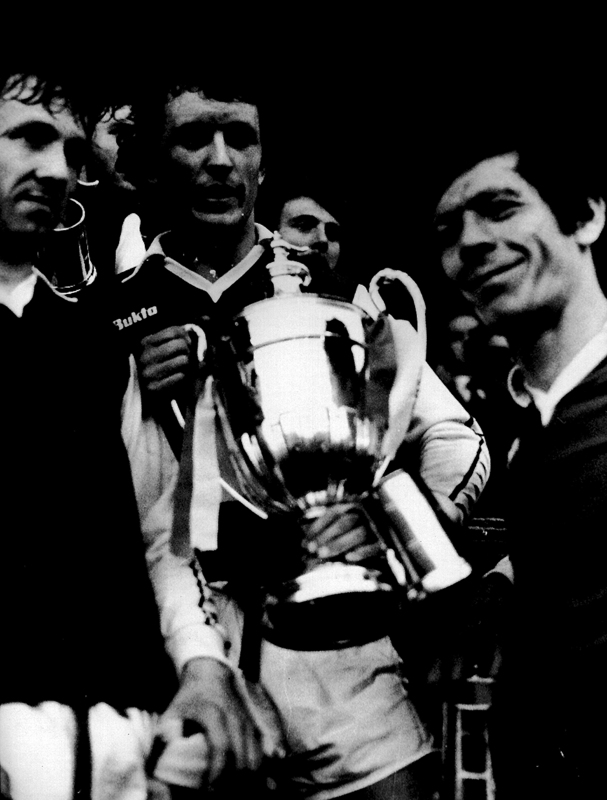 The Cup itself was to be ours come 18th May 1978. After the famous cup run came to an end on that rain-soaked night at St James Park on 27th February 1978 Blyth had to wait until May to get there revenge over Wrexham. However winning the Debenhams Cup was scant consolation for what had been so cruelly taken us back in February, Arsenal at home in the F.A.Cup Quarter Final. By the time the clubs meet again Wrexham were 3rd Division Champions and several of their side had made it into the Welsh national squad and some were unavailable for the 1st Leg due to International duty. Wrexham wanted to postpone the two-legged final until the start of the following season. However, Blyth objected to this and the games were set for 13th May at Wrexham and 18th May at Croft Park. 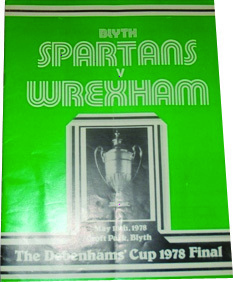 In the first game at Wrexham on Saturday 13th May 1978 Blyth finally gained their revenge against the Welshmen. 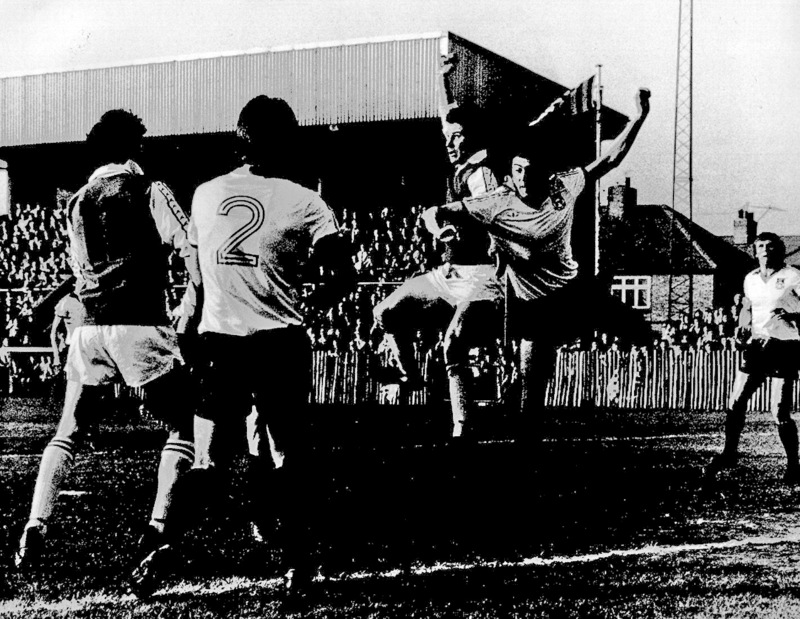 In front of a crowd of 2,300 including 300 from Blyth the visitors took the lead after only five minutes when Terry Johnson got his 33rd goal of the season following a cross from Alan Shoulder. They then had to weather a storm of pressure from Wrexham trying to get an equaliser and forcing three fine saves from Dave Clarke. However, Blyth were the better of the two teams in the first half playing a lot of constructive football of the same sort which had served them well throughout their F.A. Cup run. Wrexham were struggling with their make-shift side but their efforts finally paid off with a Graham Whittle equaliser after Blyth failed to clear a shot from Bobby Shinton. However Blyth were soon back in the lead after a mistake in the Wrexham defence let Rob Carney and Dave Varty in for Varty to score. The 2nd Leg was played the following Thursday night 18th May in front of 5,333 packed into Croft Park. Blyth had injury doubts for the return leg but top scorer Terry Johnson was determined to play despite suffering from a calf strain and also playing through the pain barrier was former F.A. 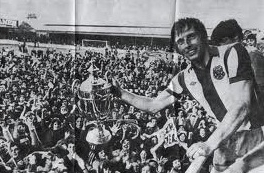 Cup winner Ron Guthrie. Dave Varty gave Blyth a dream start after just twenty minutes. Midfield maestro Keith Houghton made room in the box, feinted a cross to deceive his marker and turned outside to deliver a precision chip to the leaping Varty who headed just under the bar. This was Blyth’s 153rd goal of the season and gave them a 3-1 aggregate lead in the final. For the rest of the half Wrexham were restricted to a handful of long-range shots and in each case Blyth keeper Dave Clarke was perfectly positioned to get behind them. Wrexham caused a few worries in the Blyth camp with an equaliser in the 68th minute. 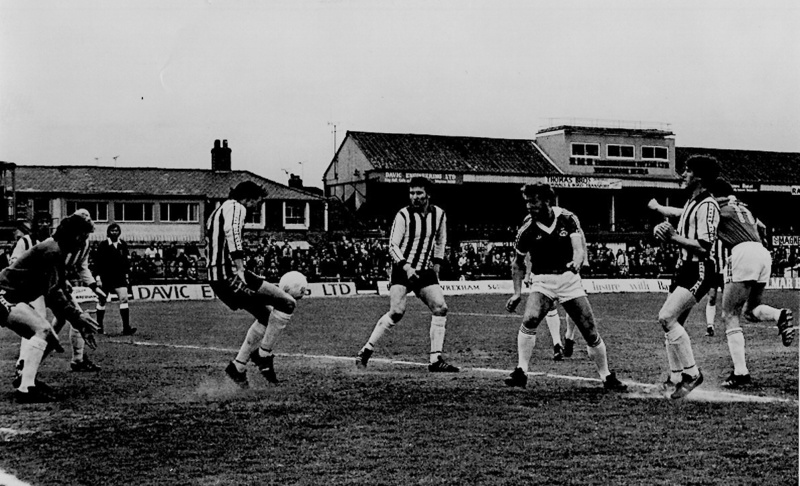 Following a good move Mel Sutton’s cross was headed past Clarke from close range by John Lyons. This left the Welshmen 22 minutes to level the aggregate scores but as time went on it was Blyth who looked more likely to score. With four minutes to go Eddie Niedzwiecki in the visitors goal had to save at the feet of Alan Shoulder, then Ian Mutrie had a shot cleared off the line before the keeper turned a rasping drive from Steve Carney over the bar. As the Blyth team & players celebrated the Wrexham team disappeared back to their dressing room and actually had to be recalled to collect their runners-up tankards. Dave Clarke, John Waterson, Ron Guthrie, Dave Varty, Ronnie Scott, Tommy Dixon, Alan Shoulder, Keith Houghton, Terry Johnson, Mick Dagless, Steve Carney. Sub. Ian Mutrie. *A footnote to the game was that rather strangely both teams wore their away strips for the 2nd Leg despite having worn their home strips on their previous 3 meetings that season. Mick Dagless, John Waterson & Ronnie Scott are presented with the trophy after the final whistle. What happened to the Debenhams Cup next is quite a mystery, both as a competition and as a trophy itself. For unknown reasons the competition was never played again which technically still makes Blyth holders of the trophy !. But the actual whereabouts of the trophy remains a total mystery. When the club held it’s Centenary exhibition in 1999 contact was made with the FA & Debenhams enquiring about the trophy. The FA had no knowledge of its whereabouts and there was no reply at all from Debenhams. In February 2001, when we played at Chester in an F.A.Trophy tie the match day programme carried an article about the competition and it would seem Chester are none the wiser about its whereabouts either. 18 years later in February 2019 new information came to light that the trophy had actually been returned to Debenhams. Five years after winning it and completely out of the blue, the club were contacted by Debenhams head office asking for the trophy back. With the competition not having been played again Blyth had just kept hold of the cup as no request had come for it’s return. In the spring 1985 the department store chain got in touch asking for solid silver trophy back, stating they wanted it back because they wanted to give it as a trophy for a golf tournament. That was the last it was heard of as a football trophy, it was unclear weather it was an internal golf competition or one they were sponsoring. The Debenhams Cup victory over Wrexham was if nothing else a fitting finale to the historic 1977/78 season, however weather it was revenge for what had gone before Blyth fans very much doubted it. So the next time your wandering around the local car boot sale and see a random old trophy have a look you never know !. This entry was posted in Classic Matches, FA Cup, Uncategorized and tagged Blyth Spartans AFC, Blyth Spirit, Chester City FC, Croft Park, Debenhams Cup, FA, FA Cup, Lancaster Gate, Port Vale, St James Park, Ted Croker, Wrexham Football Club. Bookmark the permalink. 8 Responses to The Debenhams Cup – Blyth Spartans are still the current holders ! Memories of a terrific rivalry!